I love the fun, relaxed attitude during the summer, where you lose track of what day and time it is, but it definitely messes with our meal schedules. My kids are usually on the fend-for-yourself lunch plan and I am constantly forgetting to cook dinner because it’s so bright and hot out at dinner time, and my kids usually aren’t home because they’re off with friends, that lately I’ve been ALL about the quick and easy meals. I’ve been making a better effort to plan more effectively and have my kids head home each day for dinner, but at least a couple days of the week I need something really fast. 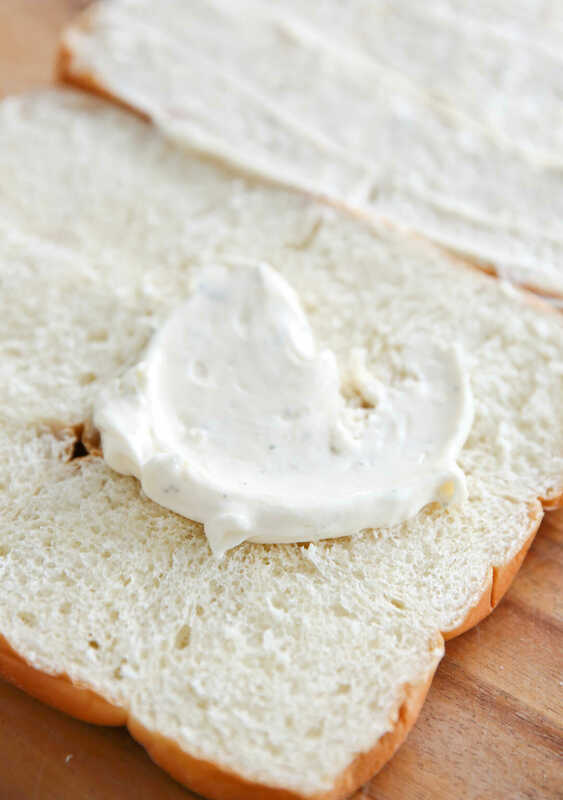 I whipped up these sandwiches last week simply because I needed to use all of these ingredients, and my kids loved them so much that they requested a repeat a couple of times since then! So I figured I’d write up an actual recipe and share a few of my most favorite “quick-fix” shortcut ingredients. I’m going to name-drop a bunch of brand names, but this isn’t sponsored by any of them- just a few things I really love and use a lot so I thought I’d share so you can maybe love them too. First up, you’ll mix up a quick ranch-mayo. It’s simply mayo with ranch seasoning mixed it. 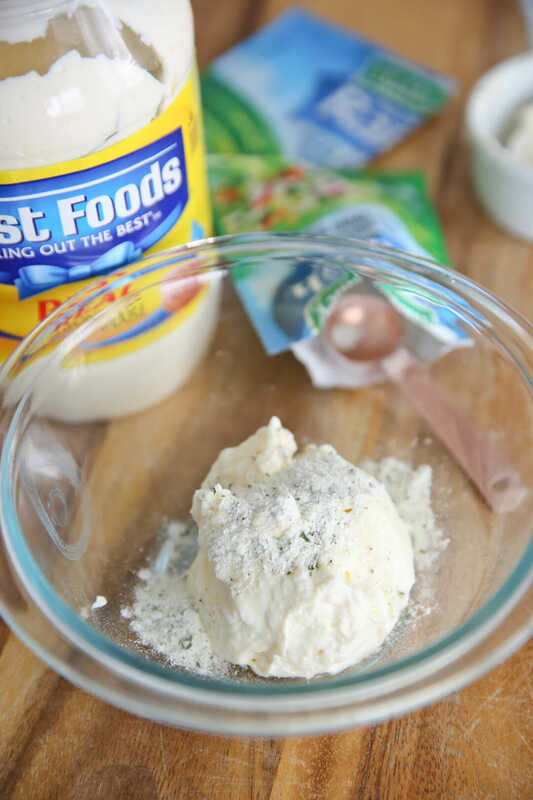 I love making homemade ranch (seriously nothing like it!) but when it comes to mixes, I am true and loyal to Hidden Valley Ranch. You’ll spread that on a pack of King’s Hawaiian sweet rolls. I buy a few of these and just keep them in my freezer so I can pull them out for quick meals. King’s Hawaiian are our favorite! Always so, so soft and the perfect sweet flavor. Don’t pull apart the individual rolls, you’re going to slice it like a giant sandwich. and then sprinkle with cheese. When it comes to pre-shredded cheese, I only use a couple kinds. Many brands have waxy additives to keep the shreds separated and it results in super weird stuff that doesn’t even melt half the time! 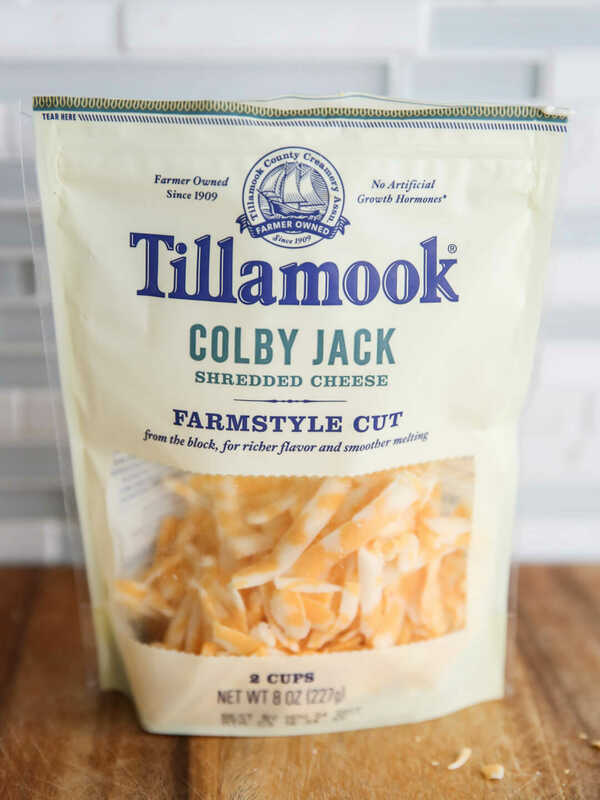 This new-ish Tillamook farmstyle cut is phenomonal. I usually keep a few different kinds on hand. 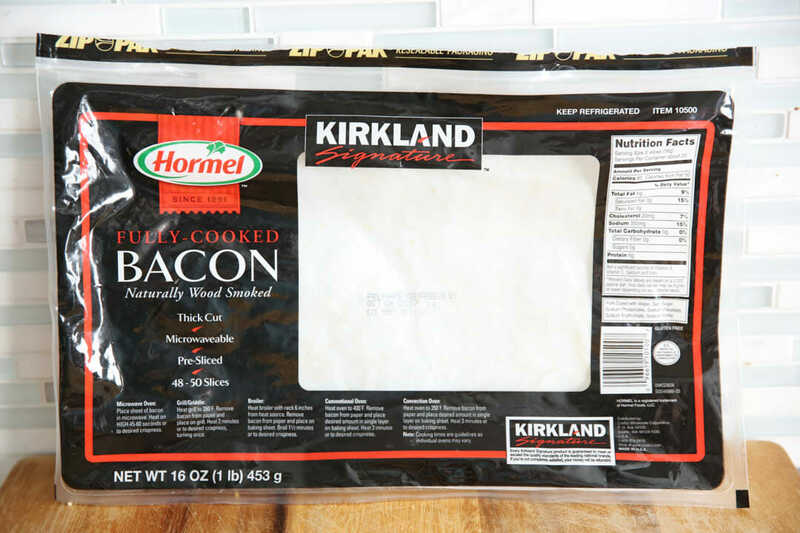 They also sell it in large bags at Costco- but if I’m going to Costco, the Kirkland brand shredded cheddar is fantastic (and cheaper) so I buy that one from Costco. It melts beautifully as well. You can use any kind of cheese you like! Then you’ll add some diced chicken. I cut it up in to really small bite-sized pieces because these are small sandwiches and you want all the ingredients really blending together and not falling out of the bread. 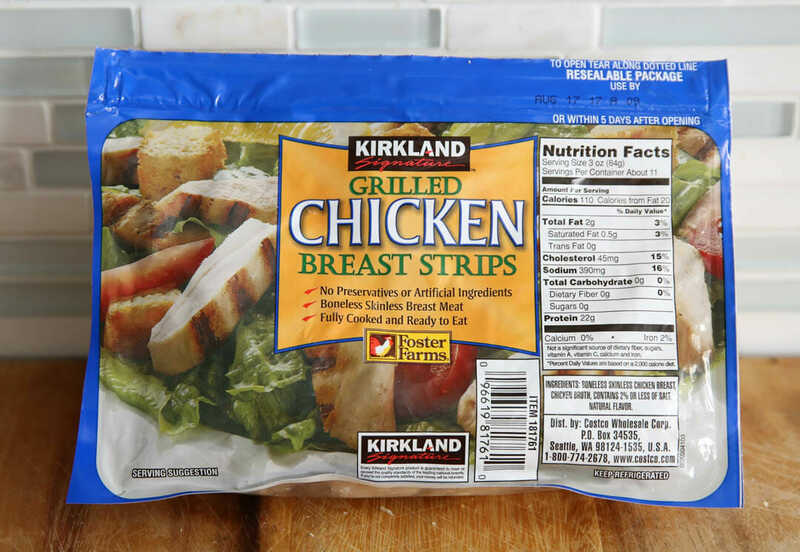 Rotisserie chicken works great here, or I also usually have bags of this chicken in my freezer. Pre-cooked chicken can be super weird, and I’ve found I like this one. I don’t eat it plain very often, but I think it’s great in recipes like this or my chicken taquitos, where you need plain chicken and you don’t want to go cook some just for this purpose. Then you’ll top it with some cooked, cumbled bacon. Notice I try to cut both my chicken and my bacon in the same size pieces. And you better believe I have a short-cut for this, too! So many kinds of pre-cooked bacon available now. We LOVE this Hormel one we buy at Costco. It cooks up crisp in the microwave in an instant and is great when you need just a few pieces and you need them quick. Comes with a ton and freezes great. 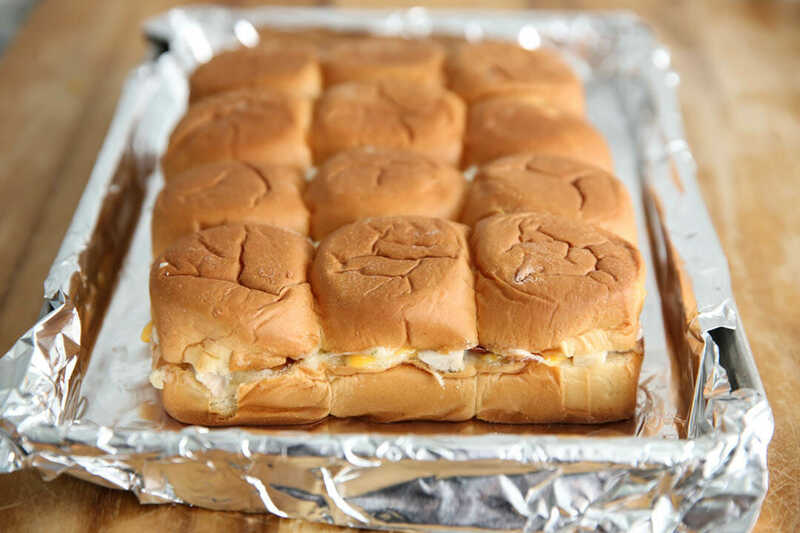 Alright, now that the sandwiches are done, you’ll cover the pan with foil and pop them in the oven for 20-30 minutes, or until that cheese is melted all the way through. Then you can cut the rolls into individual sandwiches and watch them disappear in seconds. These make a great dinner, paired with a salad and some fruit, or a terrific game-day snack on a big platter. You can easily prep them ahead of time and fit several roll packages on a baking sheet to make a ton at once. Check out some of my favorite short-cut ingredients. Are any of those your favorites, too?? Try these and let me know how you like them! 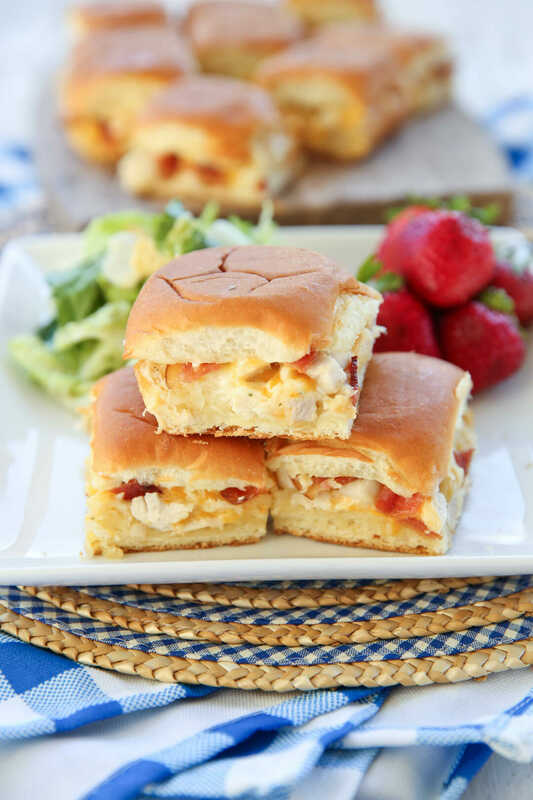 Easy and delicious small sandwiches with bacon, ranch, and chicken, perfect for a fun family meal, or a great snack for a potluck or football party. 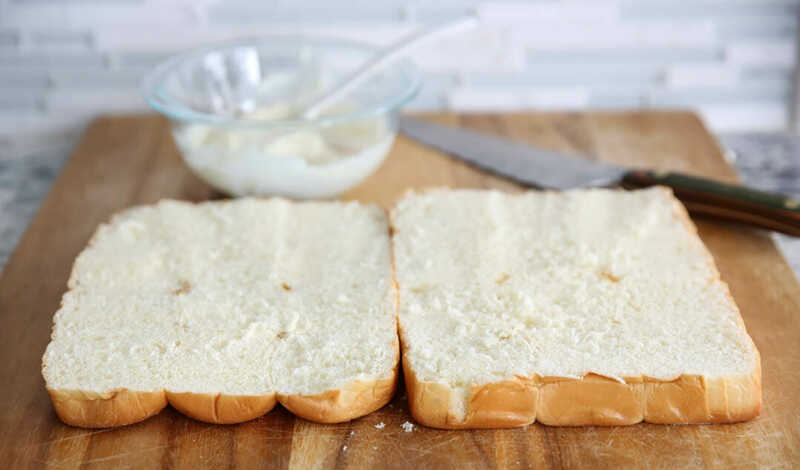 Without separating rolls, cut entire “loaf” in half like giant sandwich and open-side up on baking sheet. In a small bowl, combine mayo and ranch mix. Spread mixture on both sides of rolls. 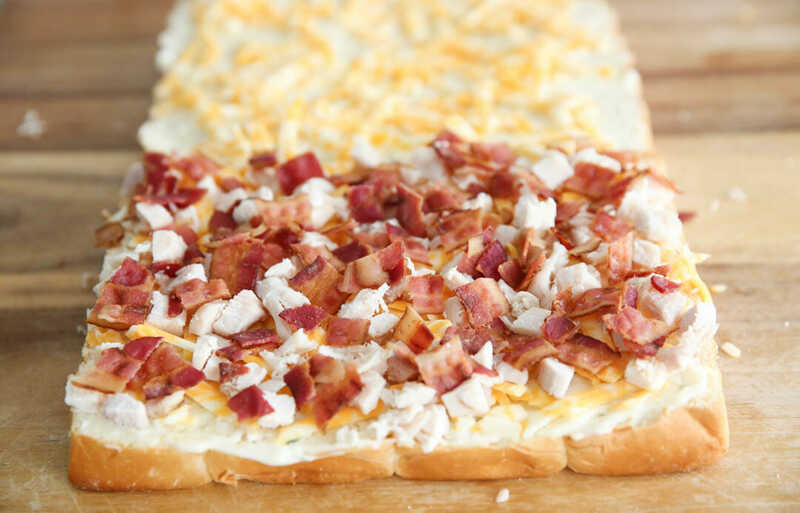 Sprinkle half the cheese on the bottom half of the rolls, top with chicken, and then bacon, and then remaining cheese. Place top half of rolls on, sandwiching them together. Cover rolls with foil and place in oven for 20-30 minutes, until cheese is melted throughout. Remove from oven and let cool for a few minutes before transferring them to a cutting board and slicing individual rolls. Okay, this is going straight onto our menu for the week. Perfect easy summer dinner! Love this! I have been making hot ham sandwiches for years with Hawaiian rolls. 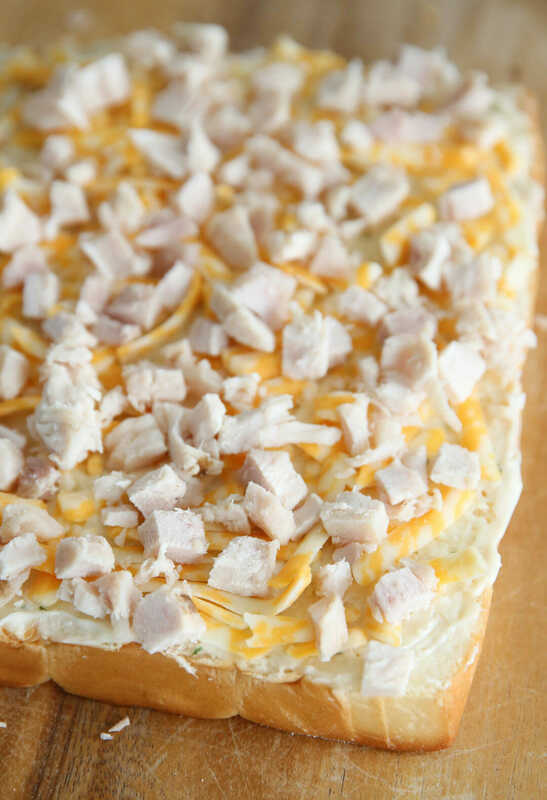 http://www.homeecathome.com/the-home-economist/hot-ham-sandwiches They are my go-to for kids birthday parties. I just made 3 large pans for my sons 6th birthday. Even though these are baked in the oven which is hot, they are so worth it. I made these for dinner last night. Seriously good. Thanks for the recipe! Thanks! So glad you loved them! These were AMAZING! Our family of 4 ate a whole pan for lunch today, and my boys said this definitely needs to go in permanent rotation. They said these are WAY better than ham rolls. Woo hoo! SO glad it was a hit! I really appreciate you mentioning the products you really like by brand name and where to find them. This is very helpful! Thank you so much. Made these tonight. Big hit. I did make 1 and half times ranch mayo so I could spread on both sides and added sliced scallion into mayo as they were so nice at farmers market. Bringing rest to lunch tomorrow. Had them for dinner last night-they were great! These look awesome! 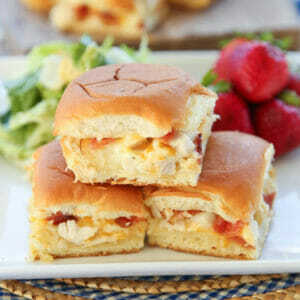 I’m making these for a crowd, how many sandwiches should I plan per person? Ummmm…all 4 of us in my family are skinny and I am pretty sure we all ate 3 each! They are that good! Lol- I should clarify, by “big people” I totally meant kids vs teens/adults haha! Glad you loved them! These look SO good! How far in advance could these be prepped? 24 hours – or would they get soggy? I think you could definitely prep a day ahead! We tried these the other night & they were really good!! It took a bit longer to make than expected though, spreading each layer, and everything kept falling off the sides. Next time I think I’m going to try mixing everything together and then spread it on. Hopefully the mayo will help contain everything! Could you substitute ranch dressing for mayo? You could, but it does tend to make things a little wet and soggy, and not quite as creamy when baked. Wow! These taste amazing!!!! I fed them to my four daughters and three nieces. They all LOVED them. Thank you, thank you, thank you! This is for sure a recipe that I will be making again. I am also telling my friends about them. Hi! My sweet daughter is reporting on her mission in a couple weeks at 9 am and then family and friends will come to her open house for “lunch”. I need some good ideas of what to serve a big crowd that can be prepped Saturday night and served with salads and something simple for dessert. Simple. simple, but yummy, yummy. Thank you!!!!! Oh how exciting for you to have your girl home! I *think* this would do just fine prepped the night before. Mayo doesnt tend to make things too soggy or anything. Another option would be to mix ALL the filling ingredients in a bowl the night before. 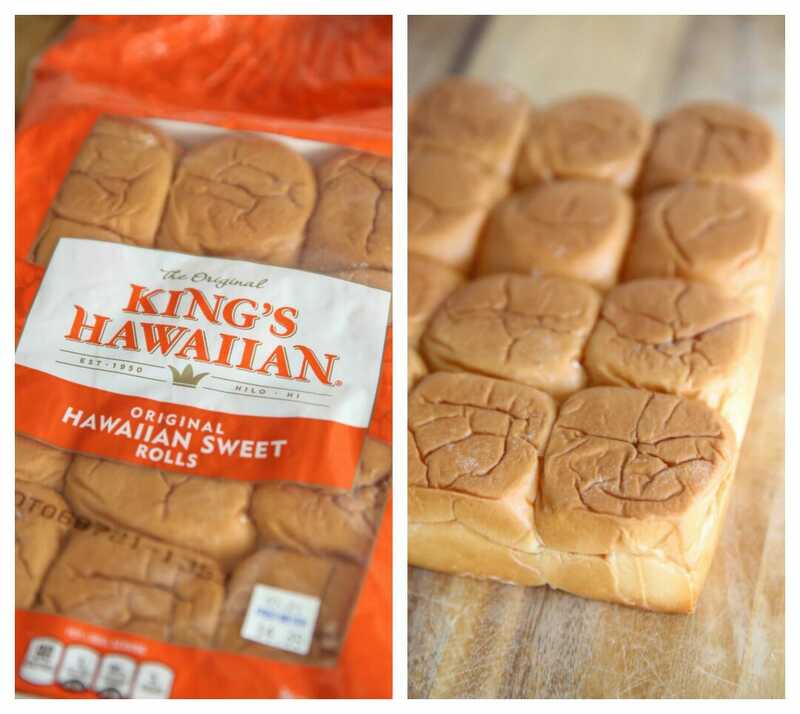 The day of, it would literally take minutes to just slice the rolls and pop them in the oven. A couple other favorites for things like that are our kalua pork, and our Pepperoncini Beef. Both of those can be made the day before and just heated in the crock pot the day of. Both are great on rolls with salad and fruit, etc. Easy peasy! Please don’t take insult but out of necessity I have to tweak your recipe to fit what I had available in my kitchen. Was afraid that it wouldn’t work but they came out amazing. And did not have the classic ranch mix so I had to use Hidden Valley Garden Green Onion Dip mix instead. Really fantastic flavor. Haha, offended- never! I’m so glad you were able to adapt and come up with something great! Thanks for sharing your method, too! I made these recently and followed the recipe as written. I prepped them about 12 hours ahead of time and baked them that evening for dinner. SO good. They were flavorful and everyone loved them. Definitely keeping this recipe for future. Thank you for a simple, easy recipe that my whole family can enjoy. I appreciate it. I was tasked with pre-dinner appetizers for Thanksgiving with the family this year. I wanted something to go along with the veggie and cheese plates I planned to bring. I found this recipe and was immediately in love. I made two versions: The traditional one listed here and a more “club” style one with swiss cheese, cheddar cheese, grilled onions, and grilled green bell peppers. Absolutely loved the simplicity, speed and taste. The whole family has enjoyed it! I just had to cook it in the oven longer for the cheese to melt. We love this recipe! Sadly, 3 of my family members don’t love bacon. They are missing out! 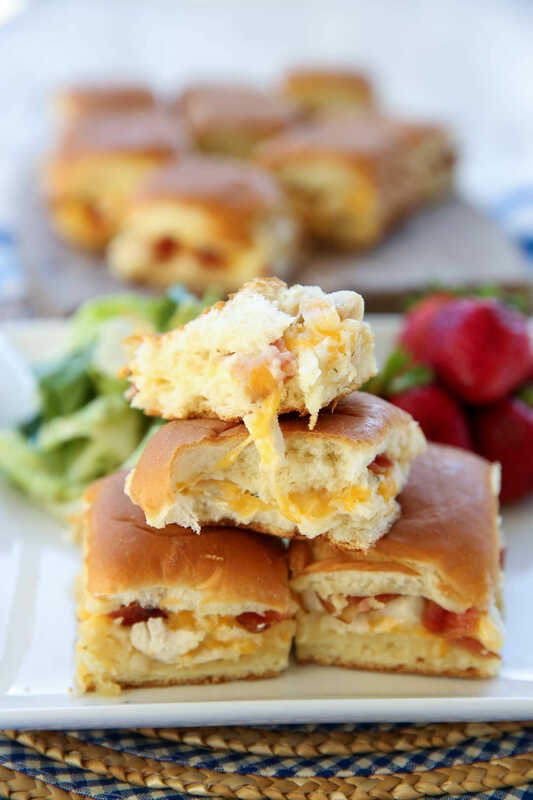 I will say – with or without bacon, these are AWESOME! I make a batch of half and half. So so good!